The Barton / 1792 Distillery is the seventh largest distillery in the world and ”1792” is its most popular brand. 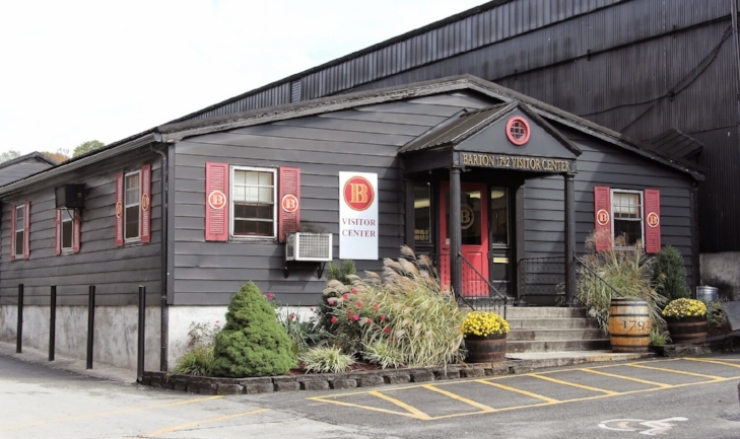 The Barton/1792 Distillery is located in heart of Bardstown, Kentucky which is the "Bourbon Capital of the World" and it produces 51 brands, labels and variations of Bourbon and North American whiskies. But it is their eight standard bourbons brands that the most people will recognize. Those eight brands are also make up 90%+ of their sales and marketing, they are; 1.) 1792; 2.) Very Old Barton; 3.) Kentucky Gentleman; 4.) Kentucky Tavern; 5.) Tom Moore; 6.) Ten High; 7.) Colonel Lee and 8.) Zachariah Harris. Barton/1792 was bought by the Sazerac Company in 2009 which is a family owned business headquartered in New Orleans, Louisiana. The history of the people involved with the distillery dates all the way back to 1845. In the mid-1800's John Graves Mattingly, of Marion County built several distilleries. One of them was named J. G. Mattingly & Sons in Louisville, built in 1845 and the other was called the Marion County Distillery which was built in 1866. Later Mattingly & Sons Distillery was purchased at auction by Paul Jones, Jr. and he changed the name to the Four Roses Distillery. Barton / 1792 Visitors Center in the Heart of Bardstown, "The Bourbon Capital of the World"
John had two sons; John G. Mattingly, Jr. and Benjamin S. Mattingly. Ben Mattingly in turn had a son by the same who went by Benjamin F. Mattingly. Ben married into the Bourbon Aristocratic Willett family when he married Catherine Willett. The Willetts were an old school, old money, old Kentucky family, that was very prominent in the bourbon-distilling world. To this dat they are still considered old school bourbon royalty, over 150 years later. One of the companies owned by the Willetts was the Franke & Willett Distillery operating at Morton’s Spring in Nelson County, just south of the city of Bardstown. Another distiller, Thomas Selvin Moore went to work at that distillery in 1874, joining Benjamin F. Mattingly. In 1876, John D. Willett transferred all his interest in the company to his Ben & Tom. Ben and Tom not only ran the business but built a new distillery themselves on 80 acres in the city of Bardstown in 1879 calling it the Mattingly & Moore Distillery. Some of the Staff and Administration of Whiskey University pictured above in the Getz Conference Room at Barton/1792 with Master Distiller Daniel Kahn in November 2018. Pictured standing from left to right; Professor Lt. Colonel Christopher Hart, Casey Williams, Bobby Graham, Devere Walker, Dakota Mercer, Master Distiller Danny Kahn, our Tour Historian Suzanne, Professor Lt. Colonel Carl Ingrum, John Hunter, Monya Hunter, Administrator Melissa Duncan and Professor Colonel Craig Duncan. The brands that they made were Mattingly & Moore Bourbon, Belle of Nelson (named after Ben’s father in-law's winning racehorse) and Morton’s Spring Rye named after the spring that the water came from. Right after the first barrels started maturing, Ben Mattingly sold his majority share of the company to a group of out of town investors in 1881. The company that bought the distillery was the main distributor of their product out of Louisville, Kentucky. Tom Moore continued to work at the new company for 18 more years until 1899, when he left and bought 116 acres adjacent to the existing distillery and built his own distillery there, producing the brands Tom Moore, Dan’l Boone, and Eleven Jones Whiskey. Large Bright Red Tops appear huge inside the black building but are only a thumbnail of the massive Fermentation Tanks that stand just outside the Barton/1792 distillery building. After Tom Moore left the distillery that was sold to out of town interests went bankrupt in 1916 and the businessmen that bought Mattingly & Moore lost their entire investment. Tom Moore worked hard enough and made enough at his own distillery, that he could afford to buy the old distillery next door and the land that it was on. He then merged the two distilleries next door, making up a plant and warehouses that sat on a total of 196 acres. Tom not only supervised the destruction of the old buildings but he helped tear down things with his own bare hands. The result of that merger became what was known as the “Tom Moore Distillery” and is now Barton/1792 Distillery today. Tom maintained leadership of the company through out most of the Prohibition years but died before repeal. During prohibition they did not receive a medicinal license. Although they were not distilling whiskey anymore for themselves, they did continue to distill a fraction of what they used to, by way of a producer’s contract with one of six companies nationwide that was granted a medicinal license from the U. S. government. In 1934 after Prohibition ended, Tom’s son, Con Moore, re-opened the distillery and ran it for almost ten years. But Con did not have the same passion that his father did for distilling, so in 1944, he sold the distillery to Oscar Getz, a Chicago liquor merchant. Getz was at that time the largest distributor of the products coming out of the Tom Moore distillery. Getz changed the name of the plant to the name of the brand of whiskey he was blending from Tom Moore selling it throughout the mid-west. The name of that brand and the new name of the distillery was the Barton Distillery, originally a name he made up and "picked from a hat" of several choices. At the time of the purchase their two top brands of straight Kentucky bourbon, Tom Moore, and Kentucky Gentleman. Kentucky Gentleman was a brand named after a nickname that Tom Moore picked up in the community. The 60 year-old Column Still is five stories tall and six foot in diameter and appears here with the Barton Logo displayed on it as it eventually leads to a beautiful Copper Tailbox. Under Getz's leadership, the Barton Distillery company went on to become Barton Brands Limited and they heavily promoted their flagship bourbon named ”Very Old Barton." Barton Brands then purchased the Glenmore Distillery in Owensboro, Kentucky. Because the Barton brand was a bigger name in the industry the merged company used that moniker. Glenmore was known for making several regional brands of their own including; 1.) Kentucky Tavern Bourbon, 2.) Ten High Bourbon, 3.) Walker’s Reserve, 4.) Old Thompson Whiskey, 5.) Imperial Blended Whiskey, 6.) Fleischmann’s Rye and several blended whiskies as well as the Mr. Boston line of diversified spirits. Eventually the Glenmore Distillery would be closed down from making spirits and the newly acquired brands were moved to being distilled Bardstown. The bottling plant at the old Glenmore Distillery continued its operations and is still used today by Sazerac. In 1993, Barton Brands which had been acquiring other brands left and right, was purchased by the Canandaigua Wine Company out of New York, primarily for two reasons. One was because they had recently purchased the Paul Mason Wines and the Taylor Wine Companies, the other was their distribution rights for Corona beer. Both wine ventures were intended to have their Brandy products distilled, aged and bottled in the Bardstown plant. Today Brandy is stilled distilled at Barton, after production it is aged on the bottom two floors of most warehouses. At the end of 1998, Canandaigua morphed into Constellation Brands, it was an international wine and spirits corporation distributing every type of alcoholic beverage made. Bourbon was a minor product for them and they had no plans to expand the flagship brand of "Very Old Barton's" distribution further than the Mid-West (KY, IN, OH, IL, WI, MI, TN). Many other of the Barton distilled spirits produced at this distillery were sold nationally and internationally. Today the flagship brand of Very Old Barton is available in 23 states (mostly in the mid-west, the east and the mid-south). Warehouse H at the Barton/1792 Distillery is located closest to the Fermentation building. Pictured inside Warehouse H is a display that holds the 1,000,000th barrel that they filled as well as the 2nd millionth, 3rd millionth, 4th millionth and the 5th million barrel. The 6,000,000th barrel is aging in that same warehouse. The former owner of the distillery, Oscar Getz was intrigued with the history of distilling in Kentucky. He was also a prolific collector of whiskey memorabilia. His collection got to be so big that he his wife forced him to “get all that stuff out of the house.” So Getz had to house his memorabilia at the distillery, and turned it into a mini museum at the old Barton plant. Barton was the very first company to ever offer distillery tours before it was a fad and his museum collection was housed where the beginning and the end of what was a very rudimentary tour. From 1957 all the way into the early 1980s, people actually thought the museum was the distillery tour. There had never been a public institution that was dedicated to capturing history and importance in the bourbon and whiskey industry. In fact, Getz was so enamored with bourbon making he wrote a book called, "Whiskey: An American pictorial History," which came out in 1978 and quickly became the definitive reference guide to everything in the Bourbon and American whiskey business for the next two decades. In 1983 Oscar Getz died and his widow Emma donated the entire collection of memorabilia and artifacts to the city of Bardstown. The city chose to place it in a prominent historic building that the city-owned, in Spalding Hall. The city named it "The Oscar Getz Museum of Whiskey History." Today, the City of Bardstown has earned the moniker "The Bourbon Capital of the World" and Getz's museum is the centerpiece that tells the story, not only of the Barton Distillery but of the entire bourbon and whiskey making profession. Thousands of artifacts are stored there on display for tens of thousands of people to visit it annually and learn about this wonderful industry. In 2002 Constellation Brands decided to follow the lead of many innovators in the bourbon industry and release a Super Premium brand in "1792 Ridgemont Reserve." That fateful decision literally changed the trajectory of the company and converted it back into a bourbon-centric corporation. Much of 1792 Ridgemont Reserve credit and image can be given to the Hiram Walker company for the concept of this super-premium brand. In fact, the original stock of bourbon used came from the Hiram Walker company. With that brand, and with the success of its great marketing campaign, suddenly the rest of the beverage world began to take notice not only 1792 but all of Barton whiskies. The Sazerac Company, of New Orleans, Louisiana purchased the company in 2009 including the distillery in Bardstown and the bottling plant in Owensboro as well as the entire Barton Brand catalog of recipes and brands. This is the same parent company that owns the Buffalo Trace distillery in Frankfort as well. Sazerac has re-named the back to The Barton Distillery from the Tom Moore Distillery. Sazerac is a big promoter of the heritage and history of brands with a history or preserving or restoring the past and heavily promoting that history.